This gluten-free and vegan pasta dish is bursting with flavorful roasted red peppers, ground chipotle pepper and its secret ingredient of homemade pumpkin seed milk! Topped off with pepitas, red chili flakes and nutritional yeast, it makes for one big, spicy and delicious bowl of healthy comfort food. Every once in a while I feel a strong streak of creativity and really want to play around with flavors in the kitchen. This is one such recipe. This Spicy Pasta Bowl is filled with savory, spicy, smoky, creamy goodness! 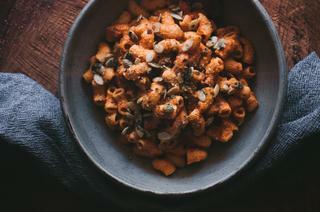 Making your own nut or seed milk is easier than one might think; and this pasta dish uses a quick and fresh homemade pumpkin seed milk to a add rich creaminess that beautifully elevates the spices used in this recipe. And the bonus? 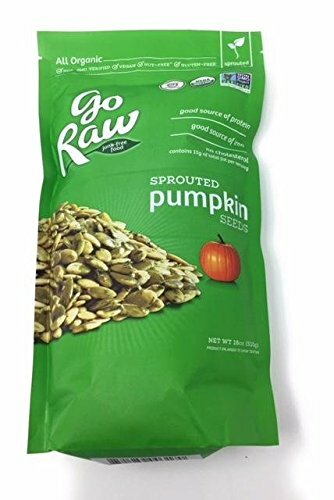 Pumpkin seeds are rich in fiber, magnesium, zinc, iron, protein, and antioxidants! 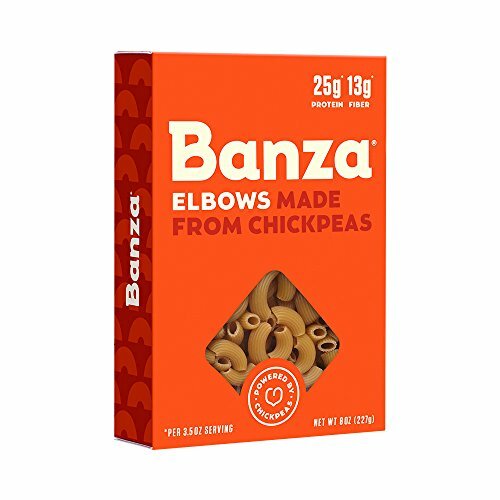 All in all, this is a genuinely tasty and unique pasta dish that is sure to add a little something extra to your lunch or dinner routines (especially if you like spicy!). Enjoy. xo. This gluten-free and vegan pasta dish is bursting with flavorful roasted red peppers, ground chipotle pepper and its secret ingredient of homemade pumpkin seed milk! Topped off with pepitas, cilantro, red chili flakes and nutritional yeast, it makes for one big, spicy and delicious bowl of healthy comfort food. Cook pasta according to package directions. Set aside.Prepare your pumpkin seed milk: In a high speed blender or food processor combine pumpkin seeds and water. Blend until smooth. Strain in a nut-milk bag or cheesecloth, and set aside.To a high speed blender or food processor combine red peppers, onion, garlic, flour, coconut cream, vinegar, sugar, ground chipotle, and red chili flakes. Blend until smooth.In a large skillet or pot heat olive oil over medium heat. Add blended pasta sauce. Simmer until you reached your desired consistency / thickness. Salt to taste.Stir in pasta. Serve and top with desired garnishes.Enjoy!